Hi, my name is Danny Pollard and I am currently volunteering for Everything is Possible (EiP) in Diadema, Sao Paulo Brazil. My receiving organisation and partner of EiP is ACER, who have a strong mission statement: “To rescue the dignity of children and young people promoting the transformation of the social environment. Serving our community using strategies for social transformation that correspond to their needs, sharing them actively with organisations and the public power at national and international level”. I am a professional sports coach from Bradford, Yorkshire, 26 years old and always looking for a new experience. I was on a coaching course back in August when i met a fellow RFU employee who mentioned he had coached in Brazil. I felt an immediate sense of adventure, a thirst to help and a hunger to seize this opportunity. 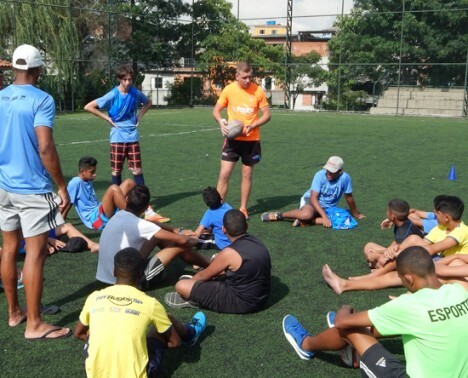 Who wouldn’t want to see the heart of Brazil, the true reality of the world for these kids and experience it for personal development and to help as much as possible? My day to day activities include coaching rugby and football. There are 4 different locations for this, 2 “quadros” – indoor 5 a side pitches, a field and an astro turf facility a bus ride away. Initially i thought i was here to coach, to use my 9 years of experience across different countries and to help build the participation levels as well as ability. It took a week for me to realise i was wrong. It’s true i am here to coach, but thats my second job. My first is to help these kids, to bring them together, to rescue their dignity. Although these children have the basics of life, a roof over their heads, clothes and food (sometimes) it is the social and psychological area of their development which needs help. The roof over their heads is not pretty, the clothes they wear aren’t the best and the cruel reality is a lot of them will never experience life outside the urban jungle of sao paulo. ACER provides experiences, it has taken kids to Australia and to Hungary, soon they will host a trip to England. ACER provides volunteers like me to coach sports, teach art and music with the ultimate goal of showing these children an environment in which they are safe, no matter what they are experiencing at home, an environment they can feel confident, where they can thrive, where they can develop socially and learn that talking helps much better than physical reactions. My second job is the host for the first, a cover story, a disguise. Although i will continue to deliver the best coaching i can, i plan my sessions on enjoyment and on social dependency, encouraging them to feel as a family so they know in hard times and it feels they are on their own, they always have each other. It’s not all work over here, i have a reasonable amount of free time which i spend with my fellow volunteer and house mate or at the local rugby club. I was lucky enough to click with Sarah and we get on really well. Which as anyone who has shared a house with someone knows, you can’t put a price on. I have been to the local football stadium to support the team (bought a t-shirt), been into sao paulo, a 2 hour multiple bus ride away, we have been to the beach and to the cinema, not as 2 people but mostly in a group of 5 or more. The people in Brazil are incredibly friendly and i consider myself very lucky to be amongst such genuine people. They have invited us out to family birthday events, down the local on a Friday night, round their house for a sunday bbq with their entire family. The novelty of having a gringo in town is quite a popular notion and everyone is always happy to meet us. I feel as though a lot has happened in the 2 weeks i have been here, a lot has changed for me and when reflecting i realise what a life changing experience this is and how it is helping me to become a more rounded, patient and empathetic person. Why patient you may ask. Well, in my local area about 8 people speak English out of the 1000s that live here. When i was picked up at the airport Luiza didn’t speak English, my manager doesn’t speak english and nobody at the shop does either. It has been a steep learning curve and i work hard everyday to learn the language. When i coach i have english speakers with me, but they don’t always understand … it’s the most frustrating thing in the world! Trying to get an idea or notion across 3 or 4 times when it’s 30 degrees and you have 15 kids sat waiting to hear what you want to say and you can’t get the message to them! It requires saint like patience, but everyday i improve and learn new words. I have to, and i relish the challenge. I think different people would react differently to this environment, the cultural shock of the infinite difference between England and this area of Brazil, Diadema – one of the most dangerous cities in Brazil. You could be intimidated, scared to leave the house alone. Never going out when it’s dark and feel isolated. I personally wanted to go out and experience, to make my own judgements and to see the reality first person. At a football game the other day i dropped $25 out of my pocket. A man covered in tattoos, stood in a gang of similar looking men in their 20s or 30s, the kind of men you wouldn’t want to see walking down the street at night towards you. He came over, picked it up, and gave it to me, saying something in Portuguese as he did so. I was so shocked, i think i might still be now! 10 years ago there were bodies in the streets here, crime and poverty at its worst. Today they are the same people, kind and honest at heart but just on the receiving end of a tough environment, when they can’t provide basics for their families or they get into an argument, they resort to what they know. Violence. They experience it at home throughout their life, the kids in the building now will experience domestic violence at home this week. We are all creatures of habit and we adapt to our environment. The Brazillians have adapted to theirs, and this has created a very unfortunate and sad place when you look beneath the surface. But if you give them a chance, if you catch them on the right day and if you are willing to put yourself out, you might just see something beautiful back. A culture of amazing people, friendly, creative and happy. Most of the time.